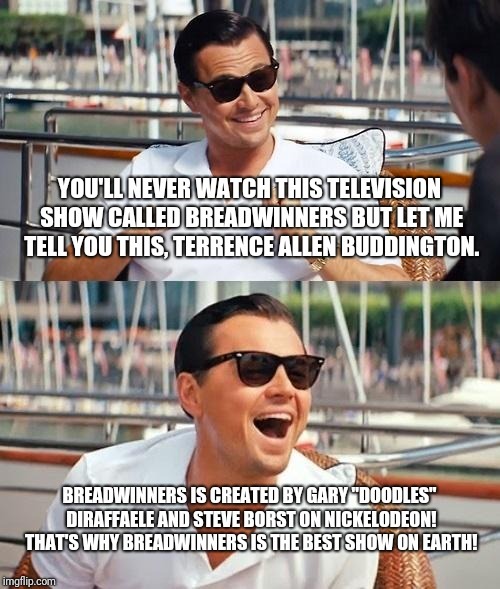 YOU'LL NEVER WATCH THIS TELEVISION SHOW CALLED BREADWINNERS BUT LET ME TELL YOU THIS, TERRENCE ALLEN BUDDINGTON. BREADWINNERS IS CREATED BY GARY "DOODLES" DIRAFFAELE AND STEVE BORST ON NICKELODEON! THAT'S WHY BREADWINNERS IS THE BEST SHOW ON EARTH!